The MA Archival Practice programme is taught in partnership with archival professionals from The Box, Plymouth. It will give you practical experience of the archive: through work-based learning in local archives, ranging from manuscripts to film, sound and digital archives, you will explore current and practical issues such as fund-raising, the varied needs of users, and how to communicate through outreach and marketing. This programme is also available to study part time (6238). The MA Archival Practice is designed to prepare you for a range of archive and related jobs, including posts with local government, national archives, museums, universities, businesses and charities. Benefit from a programme taught in partnership with archive specialists from Plymouth City Council's Museums and Galleries Archives. Develop links with local record offices and other archives – work-based learning is a key feature of the MA. Meet practical and current needs (fund-raising, employment law, archival and digital skills) for a range of employment options in the archive and heritage sector with our range of core and optional modules. The MA is designed to be a professional qualification and is aligned to the Archives and Records Association’s new competencies. Prepare yourself for a range of archive and related jobs, including posts with local government, national archives, museums, universities, businesses and charities. You can study MA Archival Practice full time over one year, or part time over two years. You’ll supplement these with an optional module where you select the areas of archival practice that you interest you from a range of options including Palaeography; Display and Interpretation; Sound and Vision. ARCHI703 Business of Archives can be taken separately as either a credit-rated and non-credit rated module, by professionals or para-professionals wishing to enhance their competencies in archives and records. You will need to undertake a period (minimum 30 days / 120 hours) of paid or voluntary employment in an archive or records service, or have experience in a post where archive or record management is a substantial responsibility, prior to starting the programme. We are very happy to help with finding a suitable pre-programme placement. If you would like to discuss options please contact Rebecca.Wickes@plymouth.gov.uk or Anne.Morgan@plymouth.gov.uk. This examines audiences and needs; and the ways archives and heritage assets are used, experienced and offered. It considers opportunities / challenges from diversity, barriers to access, research room, physical and virtual exhibitions and programme or educational project delivery. The environment for resource-user relationships is explored in terms of collaboration, community engagement, user-participation, volunteering and `citizen archivists'. The roles of new technologies (including those associated with `big data') and social media are explored. Policies, standards and evaluation are studied as critical to access and audience-engagement strategy. This module provides the student with placement opportunities organised by / or approved the MA Programme Leader in partnership with Plymouth City Council, at Plymouth and West Devon Records Office, South West Film and Television Archive and with local heritage sites. The placements will be designed to provide practical experience in several aspects including the search room, collections, or visitor-experience facing aspects of the site. Work-based learning will relate this module to aspects of management, business, audience and users explored in the other core modules, both experientially / practically; and through observation. This module addresses the dynamic and changing position that many modern day archival professionals find themselves in within their organisations. Being able to think critically and strategically about the management of resources, governance and stakeholder relations, buildings, products, people, technology, financing and budgets, sustainability through the development of commercial revenue, and advocating for higher profile through partnerships, are crucial skills. Key self-management skills such as time management, presentation and report writing, team working and project management are developed through this module. A dissertation between 15,000 and 20,000 words on an archival-focused topic. The assessment incorporates a 10% project proposal phase in semester 2, assessed by the dissertation supervisor assigned to the student. There will be preliminary discussions about the module in the MA induction at the start of semester 1 and informal conversations through semester 1 for Full Time students (and in Year 2 for Part Time students). This module concerns core professional activities and principles underpinning collections development. Students will be introduced to: the definition of archives and records, functions of archive services, the purpose and value of archives of records; the professional and legislative landscape for archive keeping and record keeping, and moral and ethical responsibilities. Core elements of professional archival management and record keeping e.g., acquisition, appraisal and description, are supplemented by study of `physical defence¿ of archives and record; preservation policies and digital preservation methods; environmental monitoring; and disaster recovery planning. This module considers the development of historic handwriting (palaeography) from the medieval period, examining some specific scripts and documents (diplomatic) types, establishing the principles of transcribing and editing manuscripts. Archaic dating practices, abbreviations and other elements of manuscripts commonly encountered in the archives, will also be studied. Manuscript material from the Plymouth collections will form the core of the material which will be read (with some training in reading Latin provided) and transcribed by students in a module that is designed to apply the theory to this important archival practice. This module is concerned with the care and management of film, sound and photographic collections; how they can be used as an effective resource for learning and engagement; best practice around preservation and storage; digitisation and cataloguing, adhering to specific description standards; the complexities of copyright, licensing, orphaned works and third part content and; the provision of content for audiences and for programming, exhibition, broadcast and production purposes. This module develops a critical understanding of how heritage organisations address their public role through displays and interpretation opportunities. Students will gain understanding about audiences and audience needs and perspectives and develop hands-on experience of a range of contemporary archive and museum practices including curating an exhibition, development of partnerships and collaborations, education, outreach and learning objectives, management and care of assets within an exhibition, marketing, evaluation and capturing data from audiences to support sustainability and legacy. A 2:1 or first class BA (Hons) degree in a relevant discipline (or equivalent overseas qualification) and a period (minimum 30 days / 120 hours) of paid or voluntary employment in an archive or records service, or experience in a post where archive or record management is a substantial responsibility. Applicants meeting these criteria are interviewed by a practising member of the profession in the selection process. We are very happy to help with finding a suitable pre-programme placement. If you would like to discuss options or if you have any questions about the programme or the admissions process, please contact rebecca.emmett@plymouth.ac.uk. You may be eligible for a discount of £2,000. Please contact the programme lead, Dr Rebecca Emmett, for details. Find out more about funding options for postgraduates. Find out more about MA Archival Practice and the practical experience you will gain through work-based learning in local archives. Explore current and practical issues such as fund-raising, the varied needs of users, and how to communicate through outreach and marketing. This special event for current and prospective MA Archival Practice students will give you the opportunity to learn about the development of a dedicated archival gallery within the new flagship heritage centre in Plymouth, The Box. Attendees will be taken on a guided hard hat tour of The Box, gaining an insight into the scope and of this exciting project, which will bring together the Plymouth Museum and Art Gallery, Plymouth and West Devon Record Office, South West Film and Television Archive and South West Image Bank, on one exciting heritage hub. Archivist Debbie Watson will discuss the design and development of the Active Archive gallery and offer first hand insights into the process behind the creation of new archival displays, the place of the gallery within the wider context of The Box, and the challenges the team have encountered. After the event prospective students will have the opportunity to meet and discuss the course with current students and staff. Places on the tour are limited, and once full, places will be assigned to the lecture only. To book your place please email rebecca.emmett@plymouth.ac.uk with your name and shoe size. On completion of The Box in Spring 2020, the MA Archival Practice will be based inside the new arts and heritage centre, built on the site of the former Museum and Art Gallery, Central Library and St Luke’s Church buildings. Until then, MA Archival Practice students will have the opportunity to work with archival professionals from institutions including the Plymouth and West Devon Record Office and the South West Film and Television Archive, as they prepare to move their collections into the new, purpose built central archive. To get a sense of scale of this undertaking, prospective students had the opportunity to join a representative of Willmott Dixson, the building contractors for The Box, as well as members of the MA Archival Practice team, for a special behind the scenes hard hat tour of construction site. The Business of Archives is a 30 credit CPD module which addresses the dynamic and changing position that many modern day archival professionals find themselves in within their organisations. Participants have the opportunity to work with industry professionals with wide-ranging expertise, based within Plymouth’s new heritage centre, The Box. This module aims to provide students with an understanding of issues in the business of archives from management of resources, governance and stakeholder relations, buildings, products, people, technology, financing and budgets, to sustainability through commercial revenue. It also provides the opportunity for students to further develop key self-management skills through team work, presentation and report writing. Management of people: leadership and teamwork. This module is delivered through 10 three-hour sessions comprising of lectures and practitioner-led workshops. Participants are encouraged to take part in the development of funding presentations, to be delivered to peers, practitioners and stakeholders in the second half of the module. The module is offered within Semester two, commencing at the end of January. The library has access to key journals in archival studies and management; and specialist texts in relation to palaeography and other topics. This degree is run in partnership with Plymouth City Council, drawing on experts in the archives sector, and with access to archival collections and facilities at Plymouth West Devon Record Office, and audio-visual and photographic collections. The resource and teaching space will eventually be housed in The Box, Plymouth. 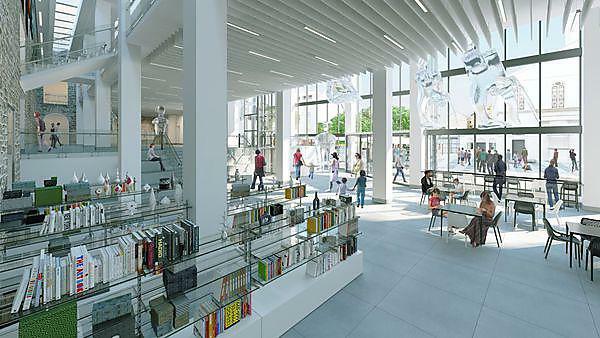 Currently under construction on the site of the former Museum and Art Gallery, Central Library and St Luke's Church buildings, this brand new arts and heritage centre is set to open in spring 2020, right next to the main campus of the University of Plymouth. This is the oldest original charter in the possession of the Corporation and is illuminated. Also referred to as the Queen Mary charter. The Old Audit book, including a reference to a venison pasty recipe. Showing entry for Robert Falcon Scott, baptised on 30th June 1868. This is the oldest document at PWDRO.